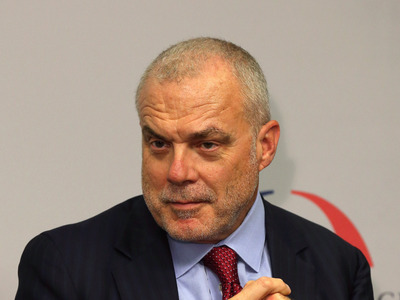 Aetna CEO Mark Bertolini stands to make a lot from Aetna’s $US69 billion deal with CVS Health once it closes. Bertolini could make as much as $US85 million in exit pay from the deal closing, The Wall Street Journal reports. Combined with the other stock and rights Bertolini has in Aetna and based on the $US207 share price of the deal, Bertolini’s payout will be $US500 million by the time the deal closes, The Journal reported. The CEO of Aetna stands to have a $US500 million payout after the close of the $US69 billion deal between CVS Health and the health insurer. The deal, announced Sunday, is expected to close in the second half of 2018. When that happens, Aetna will still operate as a standalone company run by members of the executive team. Bertolini will step away from his role as CEO and join the CVS board. The acquisition will trigger a change-of-control package for Bertolini that’s worth between $US60 to $US85 million, according to the Wall Street Journal. CVS is acquiring Aetna in a deal that values Aetna’s stock at $US207 a share. Aetna shareholders will receive 70% in cash and 30% in CVS stock. According to The Journal, Bertolini already has $US230 million of vested stock based on the $US207 price, along with $US190 million of common stock. Some of that will be converted to CVS stock. Combined with the change-of-control package, that totals roughly $US500 million that Bertolini stands to make once the deal closes. The CVS-Aetna deal creates a new type of company that includes a health insurer, a retail pharmacy, and a company that negotiates prescription drug prices with drugmakers called a pharmacy benefits manager. It’s the biggest merger to happen in the US in 2017. Bertolini joined Aetna in 2003. He became CEO in 2010 and chairman in 2011. During his time as CEO, the stock has increased by more than 480%.